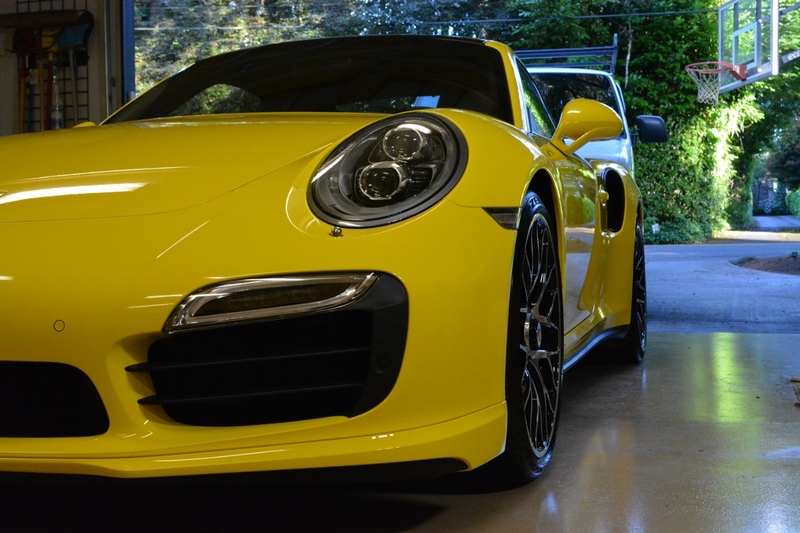 The owner of this absolutely stunning Porsche 911 Turbo S created a reservation several weeks in advance to make sure we could be there soon after delivery to get the vehicle properly detailed and coated. 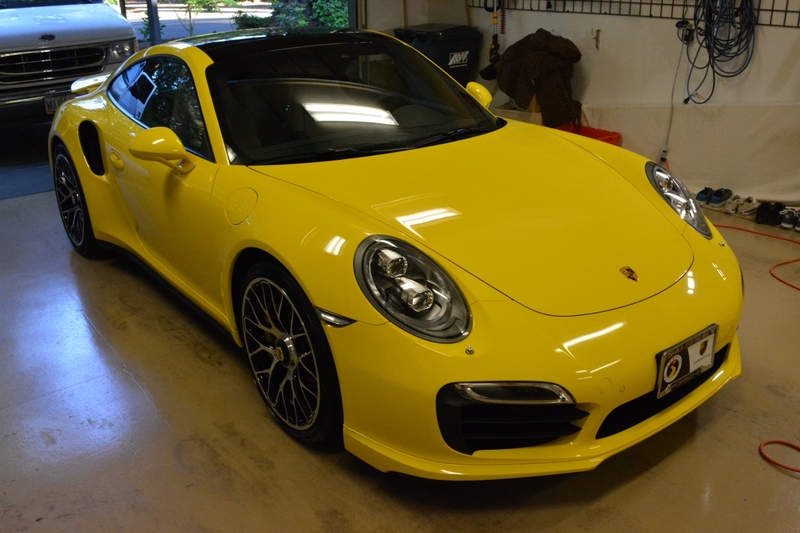 He was specifically interested in having his brand new Porsche protected with CQuartz Finest ceramic paint coating for the ultimate in long term gloss and protection. 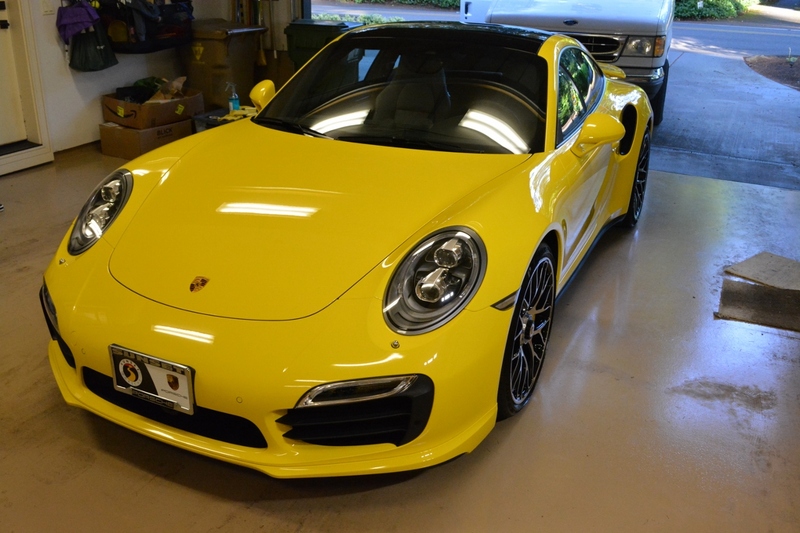 The car had already gone through a dealer prep at Sunset Porsche; however, the paintwork would be further refined with a two-step paint correction process to ensure optimal clarity and gloss before applying the CQuartz Finest protective coating. This car is an absolutely beautiful work of art. 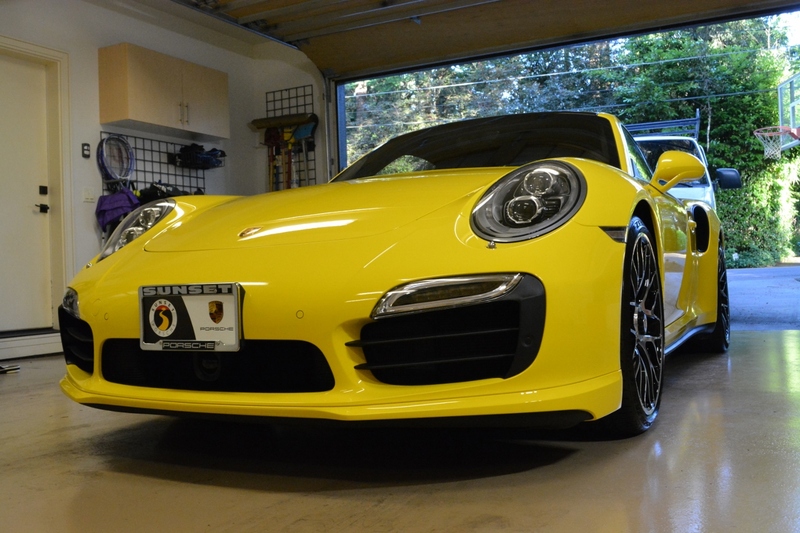 With a base MSRP of close to $190,000 Porsche calls it the “benchmark” for all 911’s. 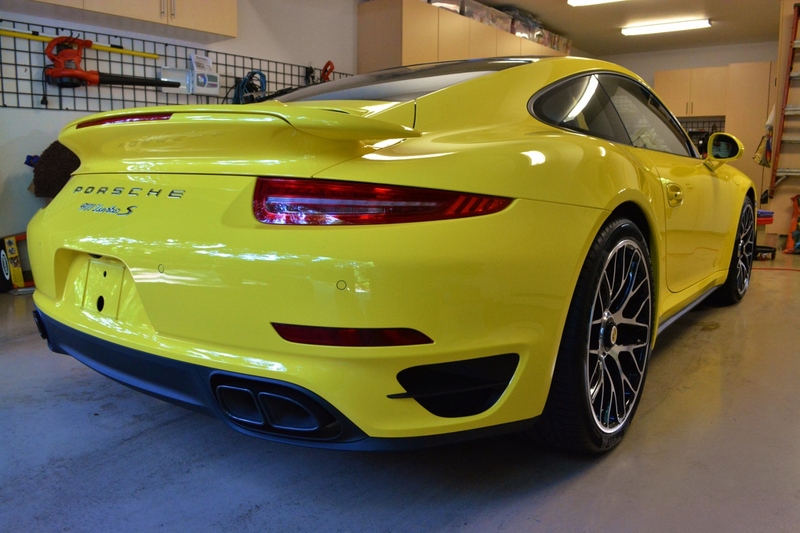 Up close there is no doubt that it raises the bar for fit and finish quality as well as displaying an undeniable “Porsche” design. The body lines evoke a sense of fluidity and motion even when parked. 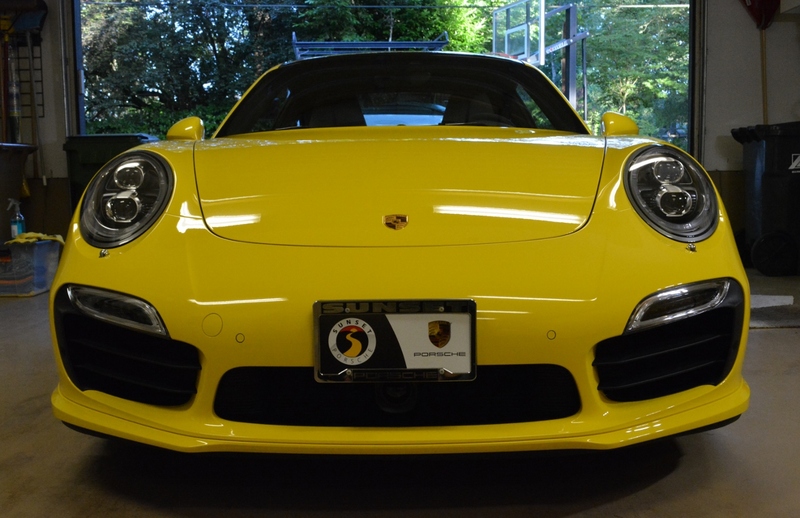 It is a sports car with a level of refinement appreciated equally by auto enthusiasts and unsuspecting bystanders. To start off the wheels were carefully attended to. 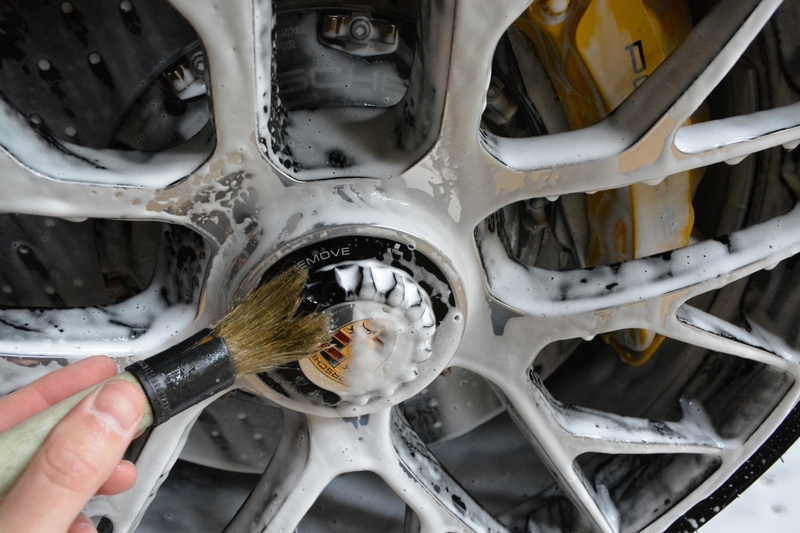 What little brake dust that had accumulated from less than one day’s worth of driving was gently removed using mild pH neutral, paint safe soap that had no potential for damaging the expensive carbon ceramic rotors. 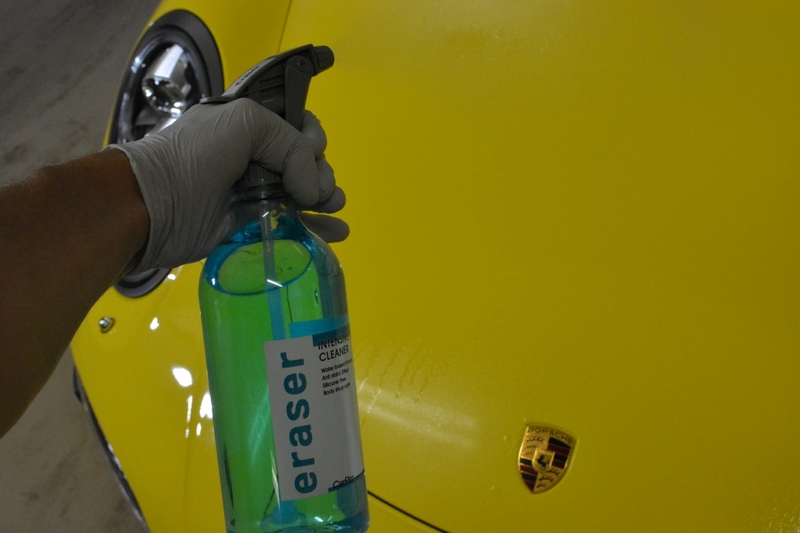 Next the vehicle received a thorough foam bath to lift and emulsify any road debri away from the paint. 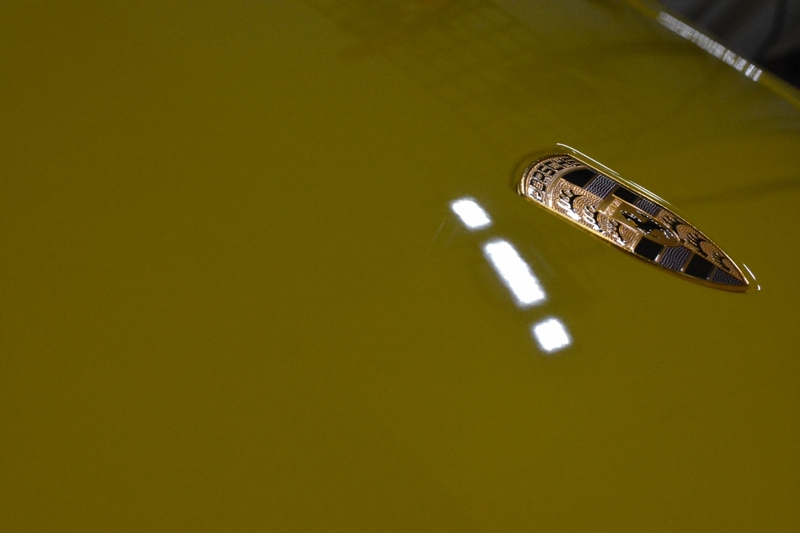 This step also began to soften and dissolve the dealer applied wax in order to reveal a “naked” paint finish prior to beginning the paint correction process. The vehicle was also chemically decontaminated to remove embedded ferrous iron particles that can lead to premature paint health issues. Lastly the paintwork was clayed to remove any bonded surface contaminates. 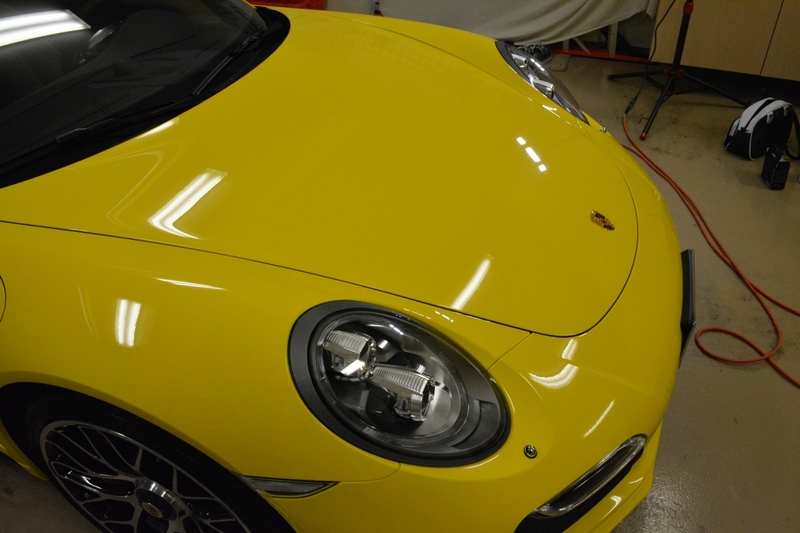 Next the paint was closely and meticulously inspected for any defects or scratches that would need special attention. 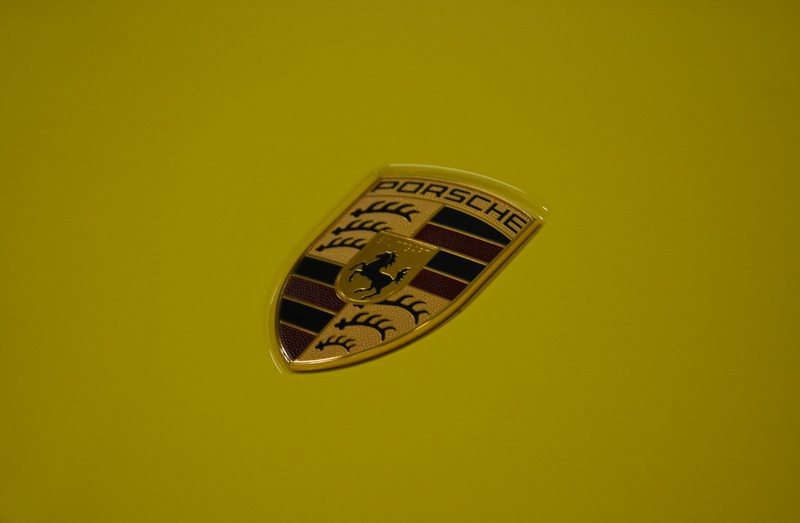 Some deep scratches were noted on the front bonnet near the Porsche emblem. These would be carefully “leveled” through multi-step polishing to refine the area to a perfectly flat, reflective, mirror finish. 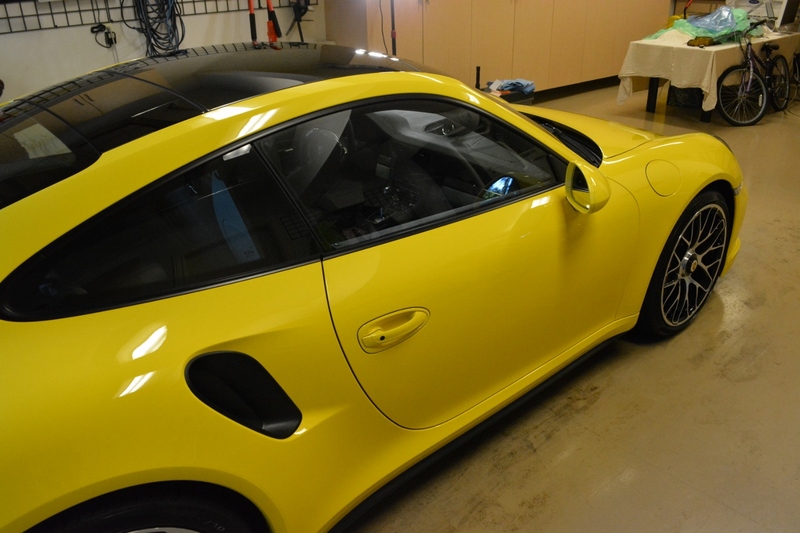 It was difficult to highlight some of the lighter defects on the Racing Yellow paint finish; however, on the black finished areas the poor dealer prep work and buffer holograms were plainly visible. 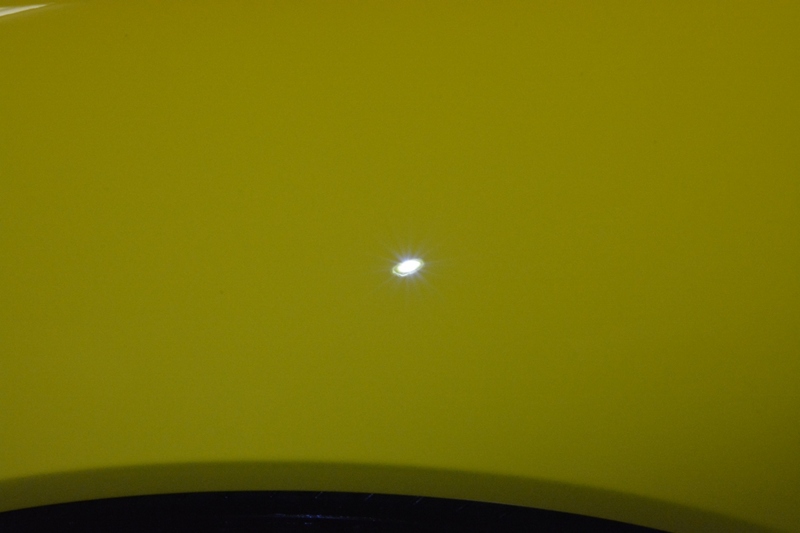 These types of defects are the result of the improper use of a rotary “buffer” which causes circular scratches in the paint’s finish that are often then “filled” with glaze. 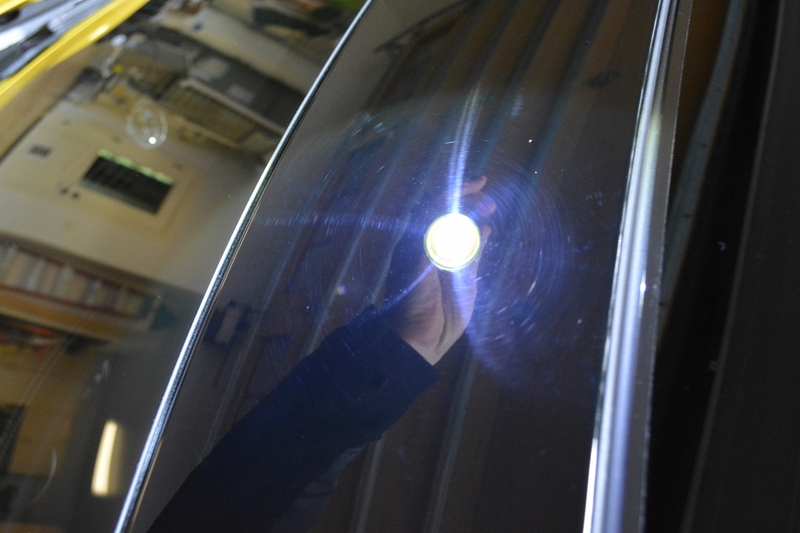 The glaze eventually washes away leaving you with ugly, shallow, circular scratches all over the car that significantly reduces the potential gloss and reflective qualities of the paint. 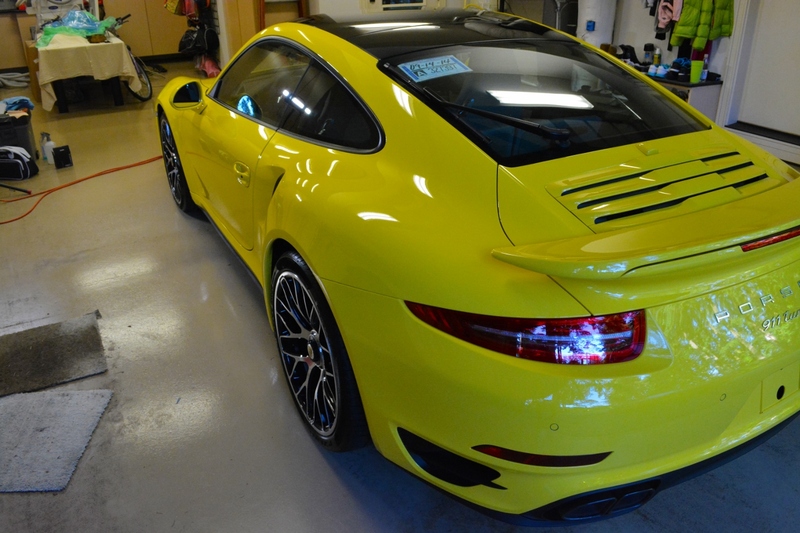 Here are the results after our two-step paint correction process. 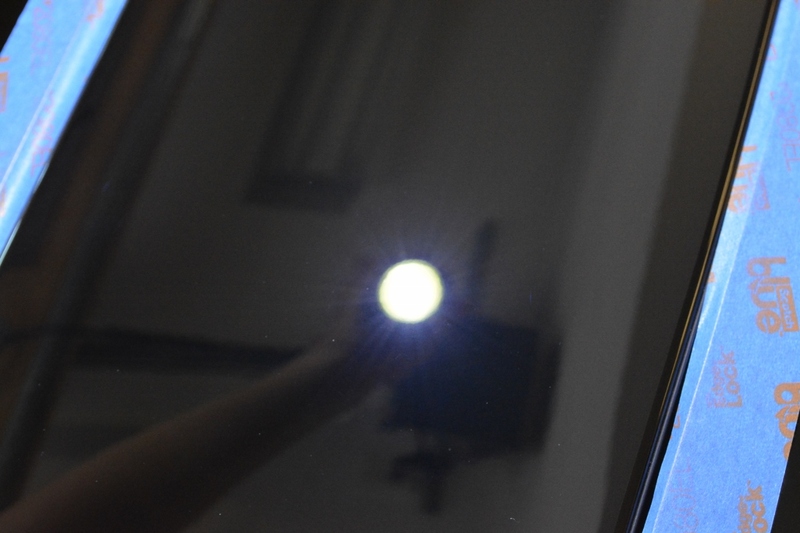 The defects have been permanently removed (not filled) and the paintwork is now reflecting light perfectly like a mirror with no hazy distortions. 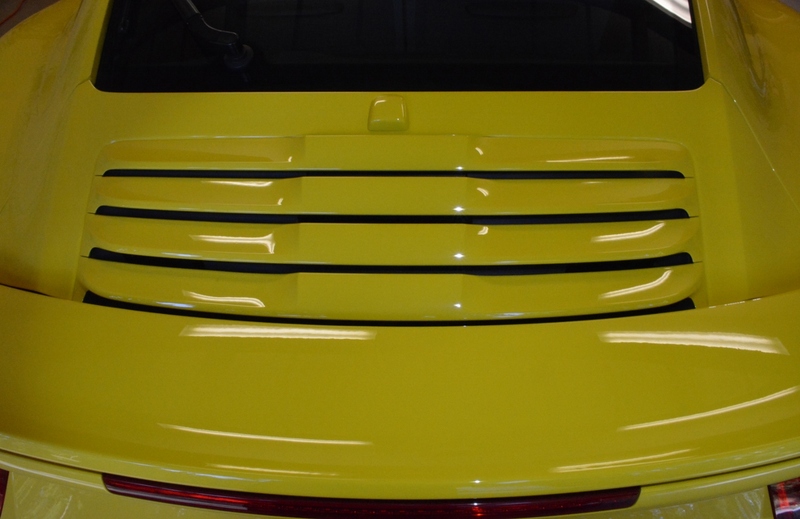 This is before any protective products were applied to the paint… simply what it’s supposed to look like after polishing the surface with the correct procedures and products. After a painstakingly thorough polishing process the vehicle was inspected with a 500 lumen LED light to ensure all defects had been removed. This light source actually highlights scratches and defects that would be invisible to the naked eye even in full sunlight. Once the paint had been polished to perfection, and I was satisfied that no defects remained, the surface was then chemically prepared to receive the CQuartz Finest ceramic finish. 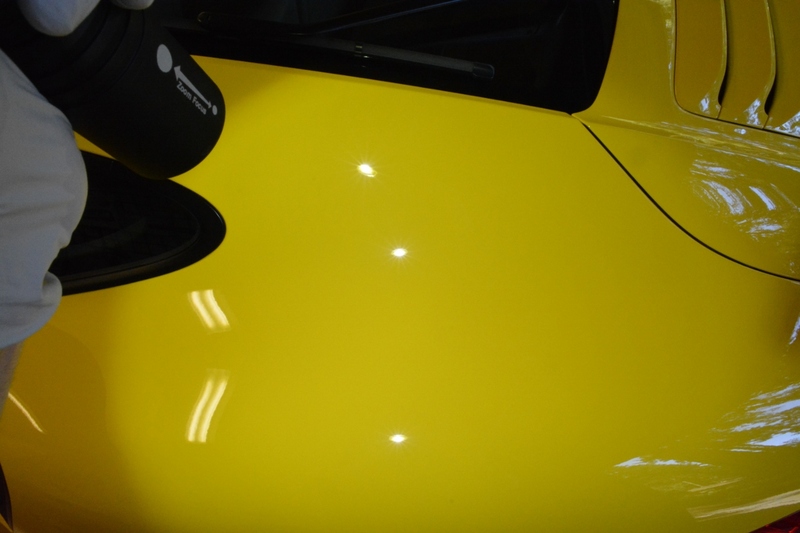 A special chemical cleaning process strips any remaining polishing oils off of the paint to ensure the CQuartz coating can form strong chemical bonds with the bare paint. A surface with oils, glaze, or wax would interfere with the coating bonding process. 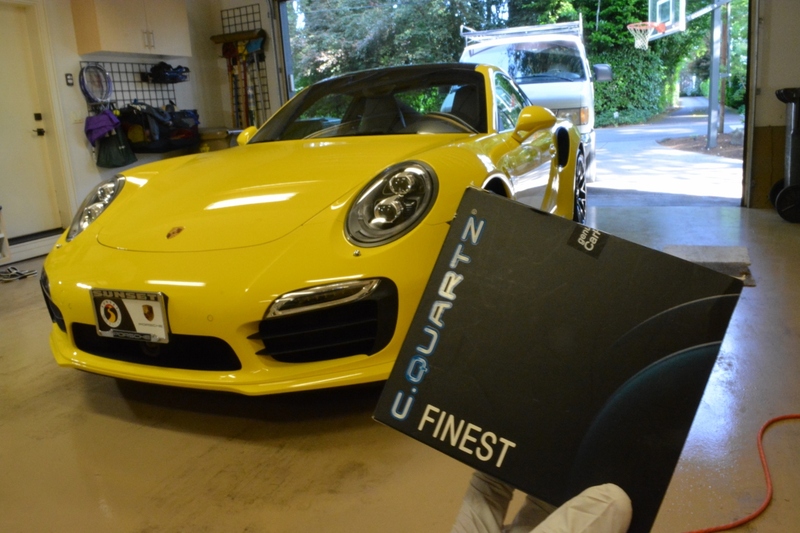 Next the vehicle was layered with two, thick coats of CQuartz Finest ceramic coating. The wheels were also coated with CQuartz Finest for ultra-durable protection from road grime and corrosive brake dust. 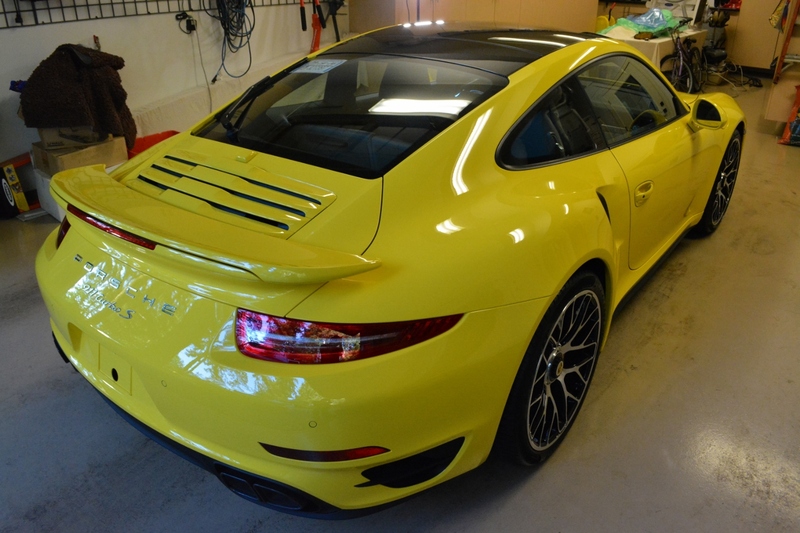 This Porsche was an absolute pleasure to work on. 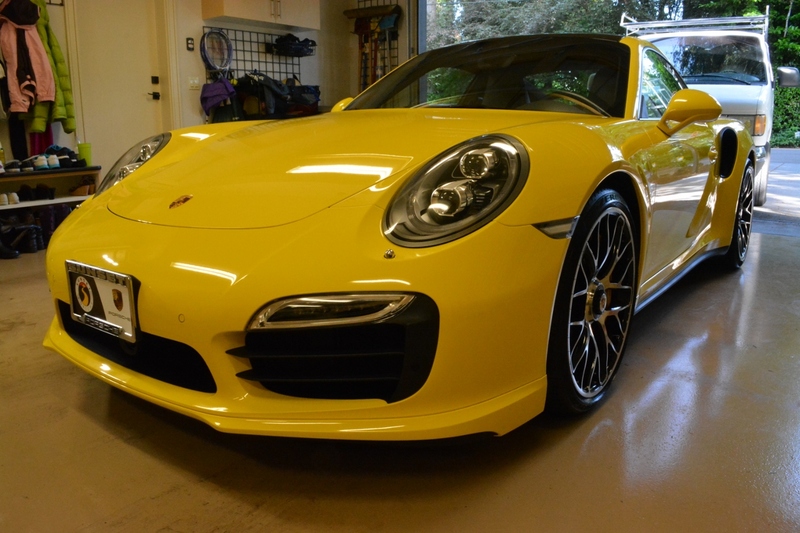 Now the owner will be able to enjoy the incredible performance and beauty of this remarkable 911 Turbo S without needing to constantly worry about the protection on the paint. 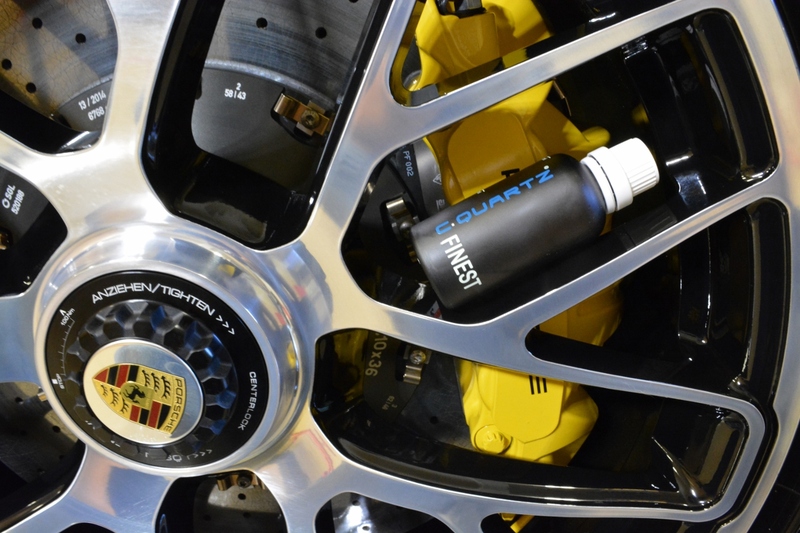 CQuartz Finest is guaranteed for 2 years and requires minimal maintenance to maintain a luxurious shine. For more info please visit our Exterior Service Menu.